There, I’ve said it, but perhaps I should add some justification for such a bold statement. The Mini Moog has become a synthesiser icon and as such has become steeped in folklore and legend, people boast of it’s prowess and it has become the synth to be seen with. This is unfortunate because in the wrong hands it is not an all rounder and can cause disappoinment (I am sure this is the source of quite a few secondhand or unused Mini Moogs). To fully understand the Mini Moog you must ask yourself the question, why did Bob Moog and his team design it? If you consider what synthesisers were like in about 1968-69 they certainly were not designed for live performance. So I think his intention was to produce a synthesiser OPTIMISED for live performance. If you view a Mini Moog from this perspective and compare it with something contemporary such as the ARP2600 I think he succeeded. If I had to choose between the two then I would plump for the Mini Moog as I consider it to be a true musical instrument and not some sort of ‘sound lab’ (I had an ARP2600 for many years but when I had to make the difficult choice it was the ARP that was reluctantly sold). The way the main panel hinges up, the space around controls, the clear layout and the large white lettering all assist rapid patching in the four bars leading up to your searing lead synth solo on a dimly lit stage. 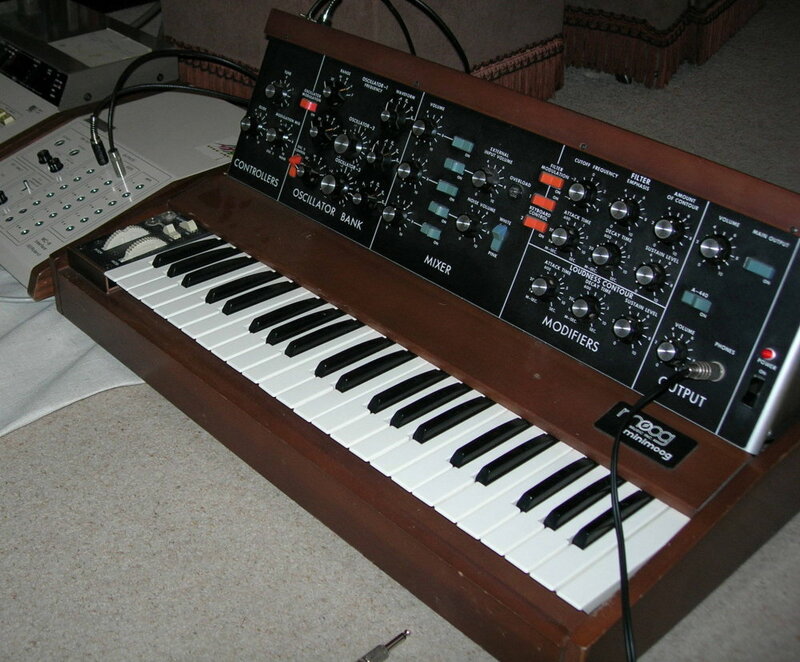 For such solos the Mini Moog has all the performance controls needed (the first synth to have mod and pitch wheels). CONTROLLERS: To the left of the 44 note F-C keyboard are pitchbend and modulation wheels plus on / off switches for glide (portamento) and decay. On the hinged front panel are Tune (used quite often!) the Glide control and Modulation mix. The modulation mix allows any combination of VCO 3 and the noise to be used as the modulation source. OSCILLATOR BANK: Three VCO’s; VCO’s 1 and 2 having triangle, triangular sawtooth, sawtooth, square, wide rectangular and narrow rectangular waveshapes. VCO 3 replaces the triangular sawtooth with a reverse sawtooth that is more useful as a modulation source. VCO’s 2 and 3 have additional tune controls (plus or minus a fifth) and all three oscillators have a six way pitch switch (32′ – 2′ plus ‘LO’). VCO 3 can be disconnected from the keyboard CV while it is being used as a normal LFO. Oscillator tuning is quite an issue on these instruments and varies between examples because of component tolerances. Later examples have a different oscillator board that is much more stable once it has warmed up (critical parts of the circuitry are heated). Earlier examples (before 10175) have a mainly transistor based design whose stability can questionable (although I know one early example whose tuning is perfect). If you are thinking of buying one check the stability of over a period of about twenty minutes and see if it settles down by comparing it with the (handy) built in 440Hz tuning reference. MIXER: Five input mixer with a level control and mute switch for each input. Inputs are form the oscillator bank, an external audio input and a white / pink noise source. The audio input also features the brightest overload indicator you will probably ever see! MODIFIERS :The output of the mixer is hardwired into a 24dB / octave (classic transistor ladder design) with cutoff frequency and emphasis (resonance) controls. There is also a depth control for the dedicated ‘filter contour’ (envelope generator). Keyboard tracking is handled by two switches giving off, 1/3V / octave, 2/3V / octave and 1V /octave, The output of the VCF goes directly to the VCA that has its own dedicated ‘loudness contour’. The envelope generators are both a slightly unusual attack, decay, release design where the decay control determines both the initial decay and release rate. The previously mentioned decay on / off switch forces the release to zero when off. A strange idea but not as bad as it sounds once you get used to it! OUTPUT: Has a main output control plus mute, a headphone socket and level control and a switch that adds a calibrated 440Hz tone to the output to assist tuning the instrument (also used quite often!). Finally there is a mains switch and indicator.On the top edge of the hinged rear panel are all the input and output sockets. Curiously missing is a keyboard CV output (although this can be added by the technically adventurous). The MiniMoog is also capable of many more subtle and various sounds. This is because the clever way VCO3 can be used as a modulation source giving you a multi waveform VCLFO that can also modulate at audio frequencies (FM fifteen years before Yamaha!). External audio sources can be modified (Tangerine Dream often fed a Mellotron through a swept Moog filter). All VCO’s can be used as sub-audio sources that can be used to great effect on a filter that is near to self oscillation. You can even feed the output back into the external input if subtlety is not your scene for some of the most industrial (and scary) noises you will probably ever hear. If you are nervous about abusing your MiniMoog with the feedback trick you can get some very similar sounds by modulating the filter at audio frequencies with VCO3’s triangle wave (keyboard control must be on). So there you have it , in my opinion, one of the best designed synthesisers ever manufactured and if I was forced to choose just one synthesiser to own then this would be it. Whilst I agree that the Minimoog is a truly iconic synth for the reasons you state, I think it is very easy to overlook some other contenders as well as some more modern classics. The first and most obvious would be the Memorymoog – a beefed up stablemate of the Mini, if a little less reliable. I would also cite the DX7 as being the synth that brought affordable synthesis to the masses and despite being somewhat ‘old hat’, it is still a very desirable and powerful synth in the present day. As regards modern contenders, am the proud owner of a Korg Wavestation and I have to say that it is something to behold in terms of its vast sonic adaptability – it is capable of some quite amazing but also some tremendously delicate sounds. Also worth a mention is the Korg DSS1 (although technically a sampler, the sample rate and time available would only allow a short snippet of sound, some it is more aligned to additive synthesis), the Roland JD800 is also a very capable and surprisingly tough cooky. I would also say that the synth I would chose as the most under-rated synth of all time (yet possibly one of the most powerful) is the Elka Synthex. Agreed as well. But as you write yourself – to choose the “best synth ever” is difficult if not impossible. There are quite a few that were not near as sucessful than the Mini, but are neverteless top candidates for the “best synth”: RSF Kobol / Polykobol; Crumar Spirit; Elka Synthex and many more. Tough question. I think that, as far as versatility goes (modulation options, range of sounds, etc..) the Access Virus TI synths are pretty awesome. But powerful machines have been made all over the years, that sounded insanely good, whilist took electronic music a couple of leaps forward…the oberheim matrix 12, the waldorf Q, the roland super jv1080, the korg M1, the korg oasys, the yamaha cs80 or the kurzweil k2000..all great machines that deserve mention.